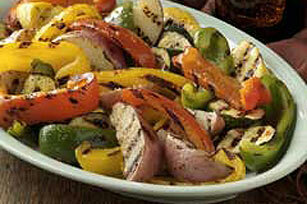 Assorted cut-up vegetables are marinated and basted with Italian salad dressing. Grilling the veggies adds great smoky flavor. Mix oil, vinegar, juice and dressing mix in cruet or small bowl as directed on package. Reserve 1/4 cup dressing; refrigerate until ready to use. Pour remaining dressing over vegetables in shallow glass dish. Refrigerate 1 hour to marinate, stirring after 30 min. Drain vegetables; discard marinade. Heat greased grill to medium-high heat. Grill vegetables 8 to 10 min. or until crisp-tender, turning and brushing occasionally with reserved dressing. Marinate vegetables as directed. Heat broiler. Drain vegetables; discard marinade. Place vegetables on rack of broiler pan sprayed with cooking spray. Broil, 6 inches from heat, 8 to 10 min. or until vegetables are crisp-tender, turning and brushing occasionally with reserved dressing.